In December 2013, I started “Thank You Very Much” at the NYCH Gallery in the historic Pilsen community of Chicago. That was a great night. I had an already solid line up with some of my favorite comics. On our first show, the line-up was Calvin Evans, Clark Jones, Willie Lynch, Jr., and myself as the host. As an added bonus, we had some of the best drop-ins that I could ask for. 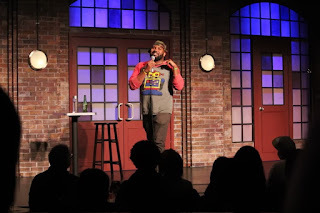 Hannibal Buress, Lil Rel Howery, and Shawn Morgan all popped in that night. It was a great show. People gave me feedback about what they liked, and what I could do to make it better. It was a show that I wanted to grow into one of the best shows in Chicago. I wanted people to be able to go into an intimate space different from most comedy venues, and be able to have an experience that they enjoyed. From the actual NYCH Gallery itself to the BYOB (Bring Your Own Bottle) aspect of it, I wanted it to feel very comfortable. We have even have a chef in the kitchen area of the gallery if you get hungry during the show. We really have you covered. From what started as a standard comedy show, has grown into an amazing variety show. In addition to Chicago’s best comics, you have some of the city’s best musicians who are dropping by for our next show on Friday March 18th. 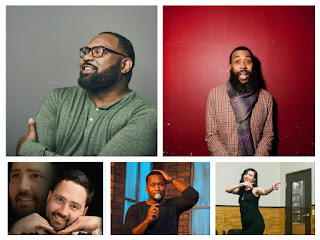 You can catch my co-producer, Felonious Munk (Comedy Central’s The Nightly Show) hosting an amazing roster featuring Drew Frees (Opener for Trevor Noah, TBS Just For Laughs), Calvin Evans (opener for Tracy Morgan, Hannibal Buress, Showtime’s Shameless) and Dave Helem (Big Sky Comedy Festival, TBS Just For Laughs, Opener for Hannibal Buress and Tony Rock). There will be a musical performance by the lovely and talented Becca Brown (Second City, School of Rock).